Still Lighting It Up Blue! Today’s post is another special one. I am joining in a Mini Blog Hop to Light It Up Blue for Autism Awareness. My friend Veronica Zalis is keeping the Blue Light shining this month, and I’m oh so glad she is. I’ve learned a lot this month. This hop is sure to be a fun one, so hopefully you can start at the beginning and check out everyone’s projects! Links are below. Most importantly, I again encourage you to check out some info at Autism Speaks… Knowledge. 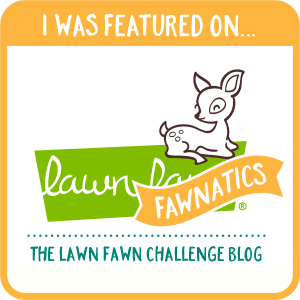 Because Lawn Fawn is generously sponsoring our little mini hop here, I didn’t waste the opportunity to use some of my favorite Lawn Fawn goodness. I made a handful of cards using this LF Crayon set before, but I gravitated to it again for this hop. Love these crayons! And these Alpha/Number dies! Eeeeek! Lawn Fawn makes some super fun stuff! Lawn Fawn Supplies: Cole’s ABC’s, Quinn’s 123’s, Say Cheese (die cuts), Color My World, Love You S’more (stamps). The Light It Up Blue mini hop celebrates the last day of Autism Awareness month! We wanted to hop one more time to remind everyone that Autism Awareness is important every day of the year! We are being sponsored by Lawn Fawn. 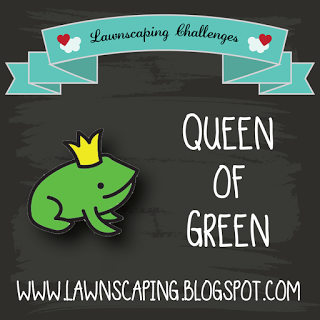 One commenter will get to pick out the Lawn Fawn stamp set of their choice. Veronica Zalis is also offering a $20 gift certificate to the stamp company of YOUR choice to one lucky winner. 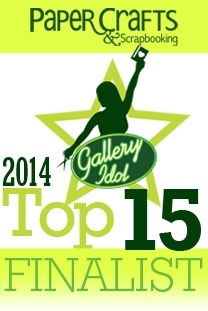 Be sure to visit all of the blogs playing along today to increase your chances of winning! Commenting closes Monday, May 4th at 12 pm. Winners will be announced on Tuesday! Next on the hop is Vera Yates! Here’s a peek at my card this week: Proof Positive. Oh my fabulous little friend. 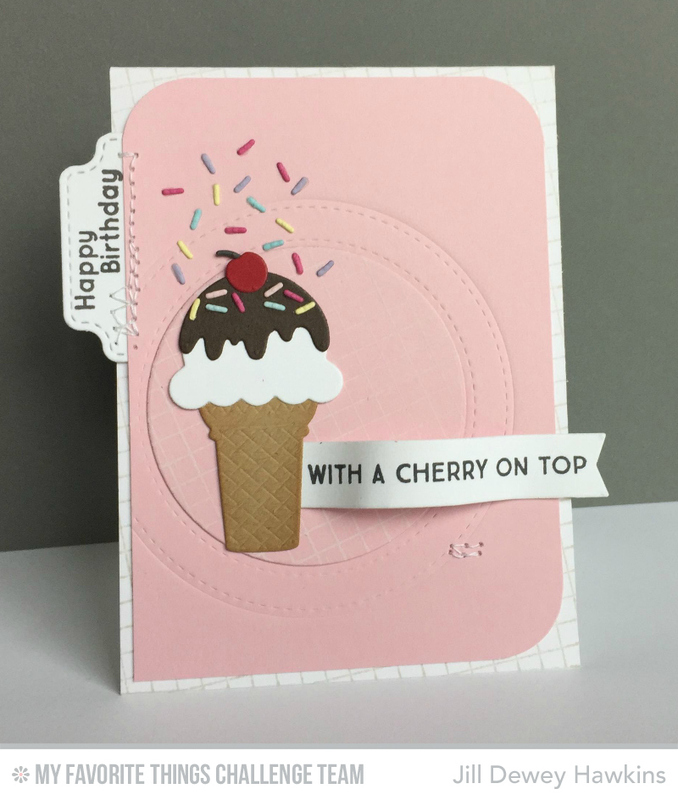 Certain to be good things to see on the MFT Card Challenges blog today! It’s been great fun having Heather Hoffman along this month–Heather makes A LOT of very cool stuff! This card is made with the following supplies at My Favorite Things: Die-namics Proof Positive Cover Up, Stitched Traditional Tags STAX, Stitched Circle STAX (dies), BG Diagonal Stripes Background, True Friends (stamps), Grout Gray (dye ink), Black Licorice (hybrid ink), Grout Gray, Berrylicious (card stock), Ranger Watercolor paper and Embossing Pad. My rock star MFTC&I DT teammates: Veronica Zalis, Vera Yates, Alice Wertz, Erin Lee Schreiner, Miriam Prantner, and Susan R. Opel! Today on the My Favorite Things Blog is an exciting announcement of exciting news! Catch my drift? It’s EXCITING!! It involves some talented people! So….GO CHECK IT OUT! 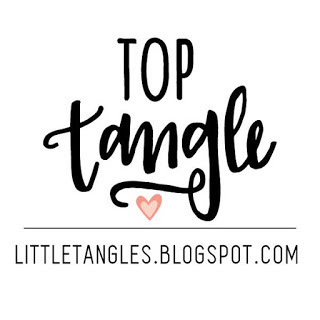 Be sure to check out the My Favorite Things Challenge & Inspiration blog for the current Sketch Challenge and the fresh new Color Challenge too! 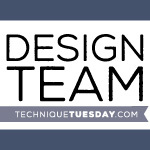 Be sure to check out the Sweet Sunday Sketch Blog for the rest of the DT projects! It’s fun to see the different takes! This card was made with the following supplies by My Favorite Things: Die-namics LJD Sweet Treats, Die-namics Stitched Circle Frames, Blueprints 23, Blueprints 24, Die-namics LLD Donuts (dies), BG Grid Background, LJD You’re the Sweetest (stamps), Grout Gray (dye ink), Black Licorice (hybrid ink), Sweet Tooth (pigment ink), Tickled Pink, Wild Wisteria, Tropical Teal, Lemon Chiffon, Ripe Raspberry, Summer Splash, Hot Fudge, Kraft, Electric Red, Steel Grey, Smooth White (card stocks), Embossing pad. You can find all the past sketches HERE. Thanks for stopping in! Hope you’ll join us! Today starts Color Challenge #20 on the My Favorite Things Challenge & Inspiration blog. If you like the purples, this one is for YOU! This project was made with the following supplies by My Favorite Things: Blueprints #23, Die-namics Stitched Basic Edges, Die-namics LLD Coffee Cup (dies), Totally Happy, LLD Perk Up, BG Grid Background, BG Diagonal Stripes, BG Typewriter Text Background (stamps), Black Licorice (Hybrid ink), Grout Grey (dye ink), Versamark, Kraft, Primitive White, Daffodil, Wild Wisteria, Lavender Fields, Lemon Chiffon (card stock). My MFTC&I DT super fun teamies: Veronica Zalis, Vera Yates, Alice Wertz, Erin Lee Schreiner, Miriam Prantner, and Susan R. Opel! 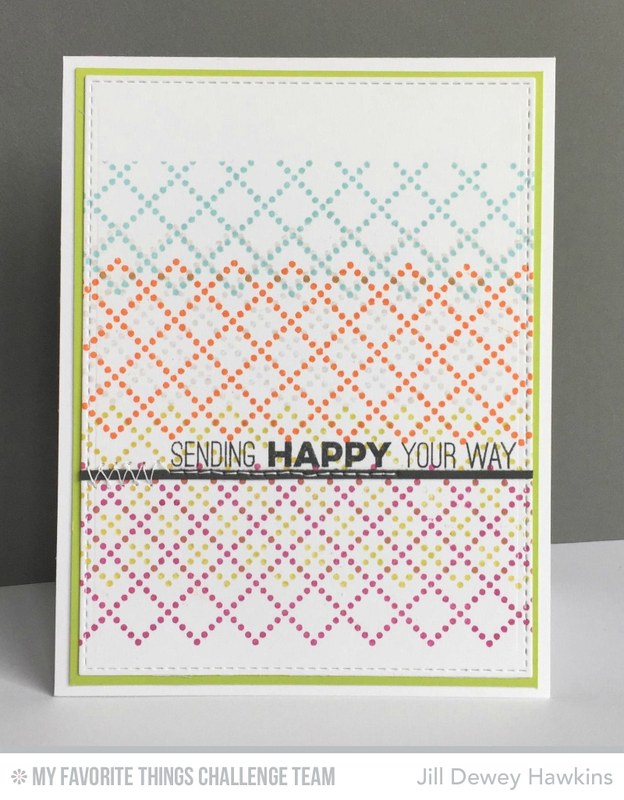 Here’s a peek at my card this week: Polka Dots. Love. Sure to be very cool takes from my teammates on the MFT Card Challenges blog today! My entertaining MFTC&I DT teammates: Veronica Zalis, Vera Yates, Alice Wertz, Erin Lee Schreiner, Miriam Prantner, and Susan R. Opel! Here’s a peek at my card. Go check it all out HERE! 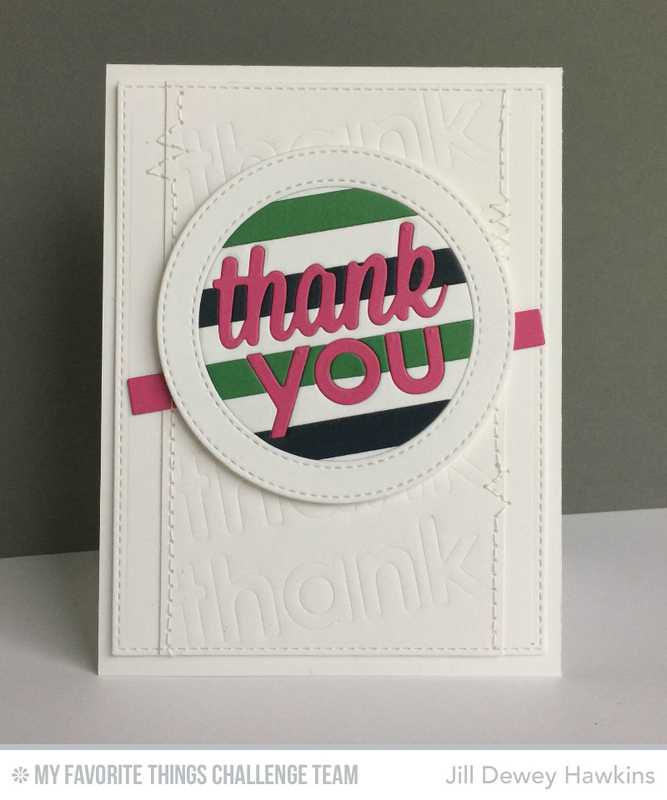 The scalloped strip is made of card stock. But looking at this photo, it looks like patterned paper right? Eeeeek! MFT Card stock & Die-namics: BFFs. This card was made with supplies by My Favorite Things: Stitched Jumbo Fishtail STAX, Blueprints #23, Blueprints #24, Die-namics MSTN Tweet on You (dies), BG Grid Background, BG Typewriter Text Background, MSTN Tweet on You, Totally Happy (stamps), Black Licorice (hybrid ink), Versamark, Grout Gray (dye ink), Primitive White, Orange Zest, Summer Splash, Nightshift, Daffodil, Kraft, Fuse Green (cardstock). Don’t forget to join in the MFT Color Challenge and the MFT Sketch Challenges too!